Afritada is one of those special, Spanish-inspired Filipino dishes that are most common during “fiestas”, birthday celebrations, and other special occasions. 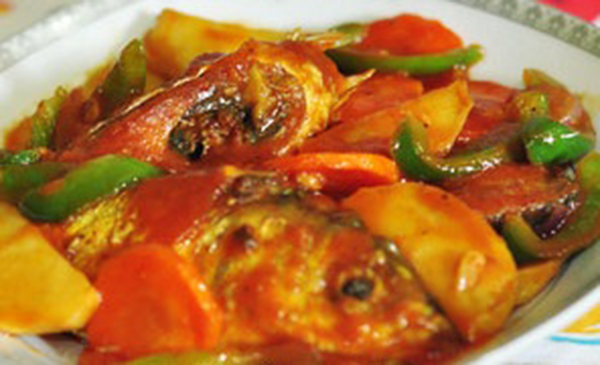 A healthier version of afritada, bangus afritada is another variety of popular Filipino tomato-based stew. 1. In a frying pan, heat oil then fry potatoes and carrots until light brown. Drain and set aside. 2. Sprinkle milkfish with salt then fry until golden brown. Drain and set aside. 3. In a pan, heat oil then saute ginger, garlic and onion. Add bell pepper then continue sauteing for 2 minutes. 4. Pour tomato sauce and water then bring to boil. Season with salt and pepper. Add potatoes, carrots and fried fish then simmer for 2 minutes. 5. Remove from heat then transfer to serving plate. Serve with steamed rice.